We have also discussed about system of linear equations with elimination and substitution method. Now let us see how to solve word problems on system of linear equations. Example: The sum of two numbers is 139 while their difference is 19. What is the larger of two numbers? Of the two numbers 79 is the larger number. Example: The sum of the digits of a two-digit number is 16. If 18 is added to the number, its digits are interchanged. What is the number? Let the unit’s digit of the number be x. Twice a number exceeds three times another number by 6. The difference between the numbers is 7. What is the greater of the numbers? 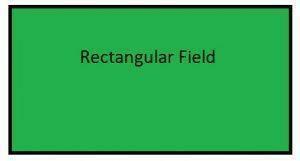 The perimeter of a rectangular field is 240 m. If length of the field is increased by 8 m and width is decreased by 5 m, the area of the field is decreased by 42 sq m. What is the width of the field? The sum of two numbers is 112. When the larger number is divided by the smaller number, the quotient is 5 and the remainder is 4. What is the smaller of the two numbers? The tens digit of a two digit number is three times the units digit. The sum of the number and the units digit is 32. Find the number. The sum of two digits in a two-digit number is 7. When the digits are interchanged the number is reduced by 9. What is the number?